New website - art, design, print and workshops all featured! 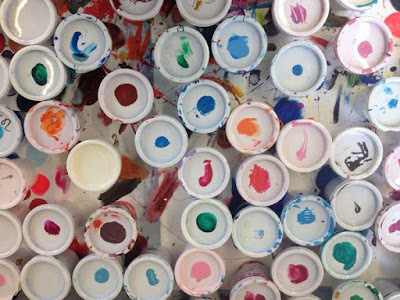 I've been putting the finishing touches to my new website that aims to encapsulate all my art, design, print and teaching activities. 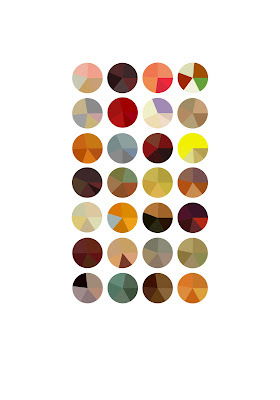 New prints on sale, made using Colourstory. Made using Facebook photos taken at Ashton Court, Bristol and Colourstory. 1 of 2. Pigmented Inkjet print on Somerset Satin 100% Cotton paper. Made using Instagram photos taken on the island of Sifnos, Greece and Colourstory. One off Pigmented Inkjet print on Somerset Satin 100% Cotton paper. Made using Facebook photos taken on a day out in Cardiff and Colourstory. Paying homage to Monument Valley. 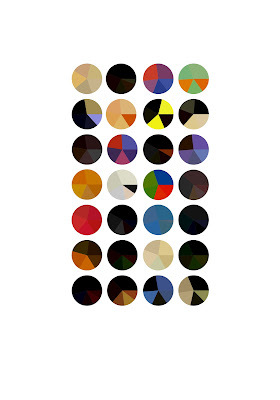 Read clockwise, this limited edition print charts the full gameplay palette of the modern classic puzzle game. Limited edition of 20 50x50cm fine art inkjet prints on 180gsm matte paper. Signed and numbered by the artist. 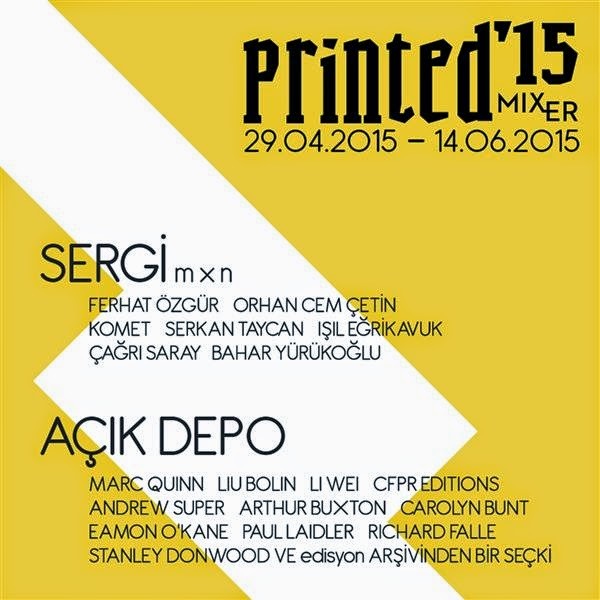 Thanks to CFPR Editions my Vogue print series is being show alongside work by Marc Quinn, Paul Laidler, Stanley Donwood, Carolyn Bunt and Richard Falle in Istanbul until 14/06/15. This colour timelines charts the progress of Braque's colour palette. 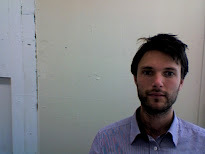 It is part of a triptych. I've taken 30 of Braque's oil paintings from 1901-09 and used custom software to extract the four most predominant colours from each one. 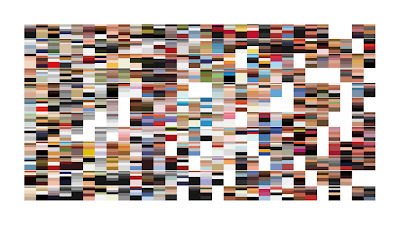 The colours are presented as bar charts which I've arranged end-to-end, in chronological order. Braque - 20cm W x 25cm H fine art inkjet print on smooth 225gsm white archival cotton paper. Signed and numbered limited edition of 35. £38 including international shipping. 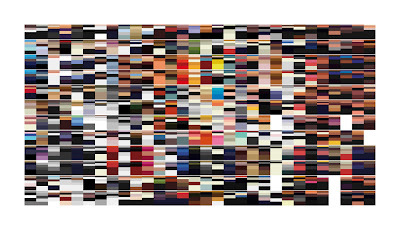 If you are interested in this concept and would like to make your own using any set of images then keep an eye on my Colourstory project on twitter. In 1906 Matisse met Picasso.The two became lifelong friends as well as rivals and are often compared. 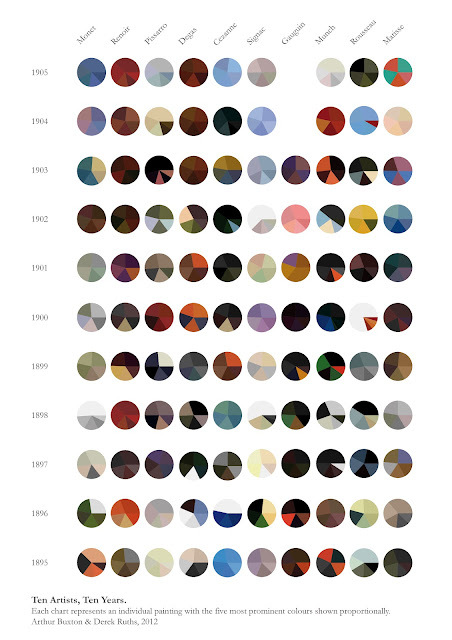 Read clockwise, these colour timelines chart the progress of each artist's colour palette from 1901 -1909. 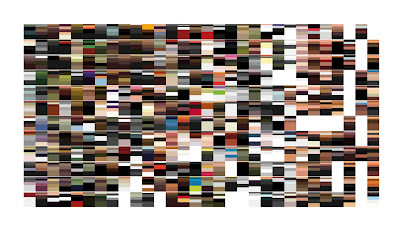 I've selected thirty oil paintings by each artist and used custom software to extract the four most predominant colours from each one. 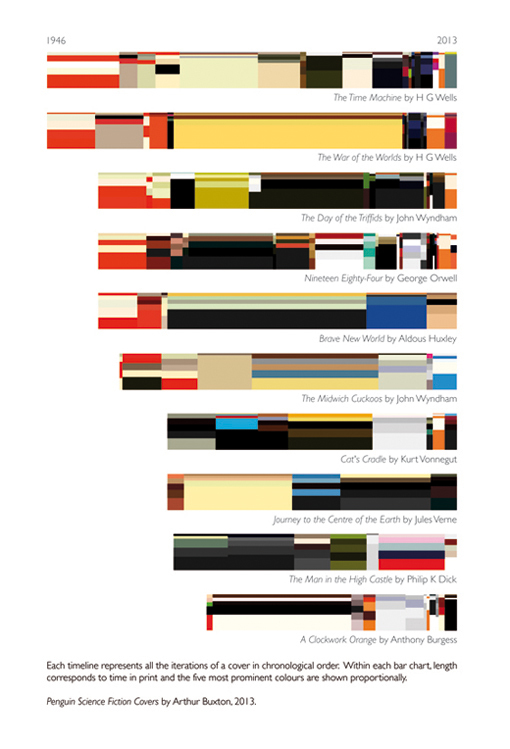 The colours are presented as bar charts which I've arranged end-to-end, in chronological order. Can you identify Picasso's infamous 'blue period'? 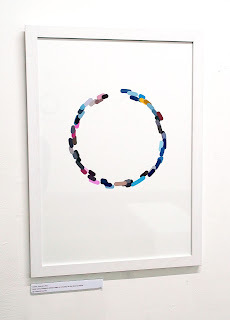 Matisse - 20cm W x 25cm H fine art inkjet print on smooth 225gsm white archival cotton paper. Signed and numbered limited edition of 35. £38 including international shipping. Picasso - 20cm W x 25cm H fine art inkjet print on smooth 225gsm white archival cotton paper. Signed and numbered limited edition of 35. £38 including international shipping. Postcard packs now for sale! 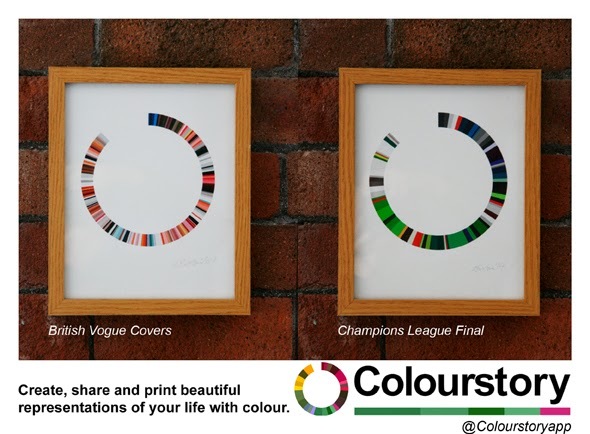 The Colourstory postcards are A6 size (105mm H x 148mm W) and printed on smooth high white 300gsm card. Title, description and contact details printed on reverse, otherwise blank. The evolution of Picasso's palettes come to life in this 20cm W x 25cm H fine art inkjet print made using archival inks and paper. This brand new limited edition print charts the great artists' oil paintings from 1901 to 1909. His most commonly accepted periods during this time are the Blue Period (1901–1904), the Rose Period (1904–1906), the African-influenced Period (1907–1909). Signed and numbered in a limited edition of 35. So pleased to announce that our Colourstory Kickstarter campaign was a success! Watch this space for more updates. On Friday the 13th of June Watershed's technologist David Haylock and I took the train to London to participate in Hack the Space - a digital art event to launch The Space which took place in Tate Modern's Turbine Hall. 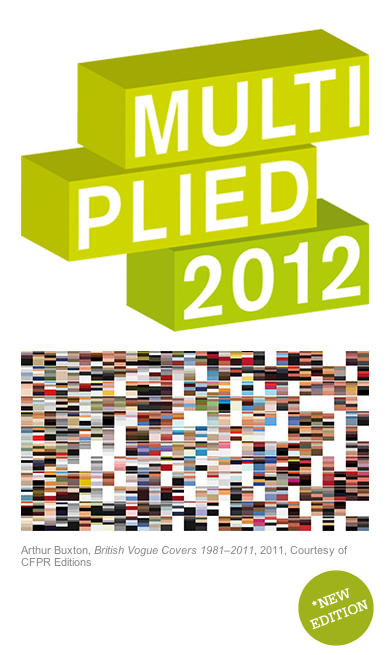 We were among about 150 other artists and programmers who took part, working in teams or alone, to create art from data over 24 hours. 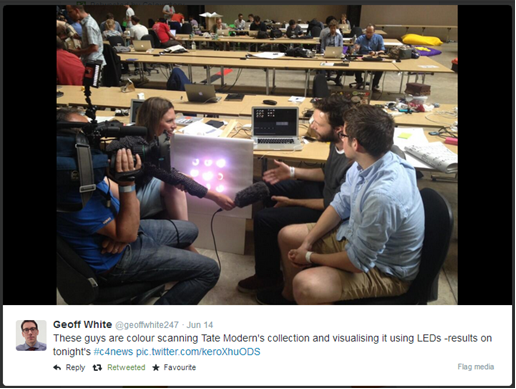 The piece we made uses RGB LED's called NeoPixels which display the main colours in a painting. Our light sculpture is a chronological representation of the Tate's painting archive which takes about an hour to cycle through the collection of 4500 images. More on what we came up with here. On June 19th I am excited to be launching a campaign on the popular crowdfunding site Kickstarter. 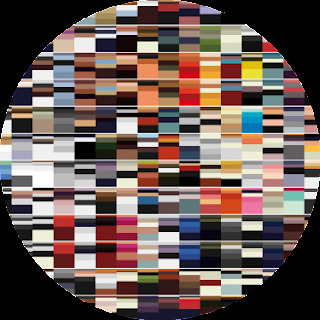 Raising money to build a web platform which will enable anyone to personally create beautiful colour timelines using any set of images at the touch of a button, the campaign will run for thirty days. Follow @Colourstoryapp to keep up to date with the project! 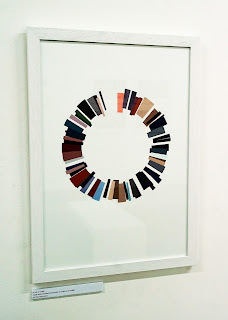 Students at 'Proof' UWE Print Centre Staff Show reading a Colourstory. Building on everything we learned during last year's REACT funded feasibility study I'm very excited to have founded Colourstory Ltd. in January this year. 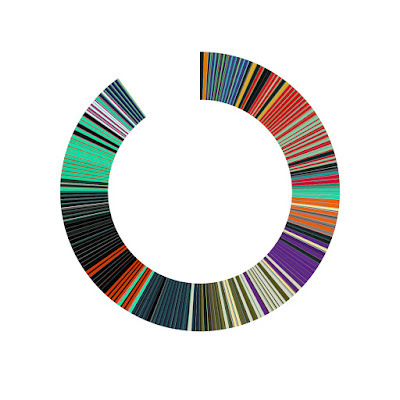 "The Colourstory apps allow users to automatically create, share and play beautiful abstract representations of their lives using colours extracted from their photo albums. Colourstory is fun, easy to use and thought provoking." The apps and website are currently under construction, so in the meantime follow @colourstoryapp on twitter for daily updates, artworks and quizzes. This has been made possible by residencies at WebStart Bristol, who are based in The Engine Shed and The Pervasive Media Studio at Watershed. For more info pease don't hesitate to get in touch. 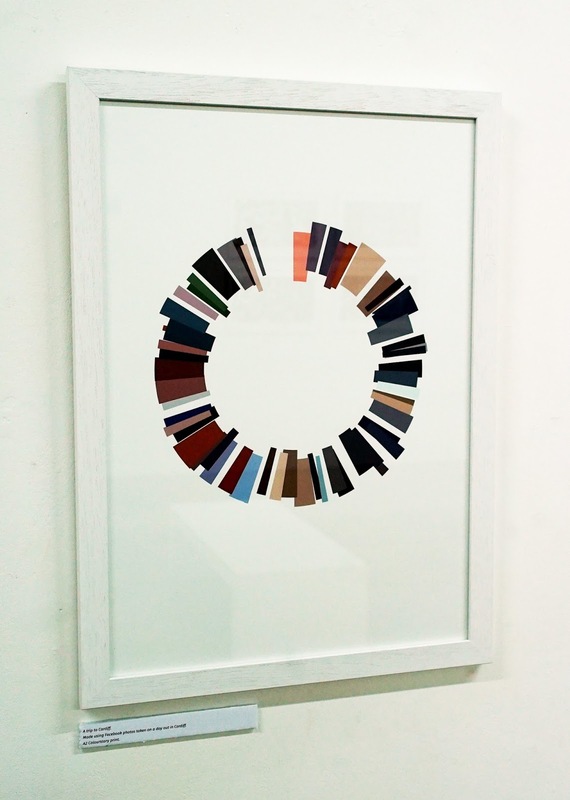 Here's three brand new colour trend timelines that I'm releasing as limited editions of 50, printed on Somerset Velvet 225gsm fine art paper using archival UV inkjet inks. They're a tribute to three classic children's books - The Snowman, Where the Wild Things Are and The Very Hungry Caterpillar. Using custom software, I've reduced each page in all three books to it's main five colours proportionally according to size, then arranged each resulting chart in sequence. As well as the dramatic difference in each illustrator's palette, narrative information such as day and night times are revealed - if you look closely you can even tell what kind of fruits the Caterpillar ate for breakfast. Snowman - Limited edition of 50 signed and numbered 50cm (H) x 50cm (W) printed on Somerset Velvet 225gsm fine art paper using archival UV inkjet inks. £50. Wild Things - Limited edition of 50 signed and numbered 50cm (H) x 50cm (W) printed on Somerset Velvet 225gsm fine art paper using archival UV inkjet inks. £50. Caterpillar - Limited edition of 50 signed and numbered 50cm (H) x 50cm (W) printed on Somerset Velvet 225gsm fine art paper using archival UV inkjet inks. £50. I'm honored to have my 'Ten Years, Ten Artists' print featured in the debut edition of 'The Best American Infographics' edited by Gareth Cook featuring an introduction by David Byrne. The beautifully designed book is launching at The Rubin Museum of Art on Wednesday October 9th 2013. Tickets are available here. 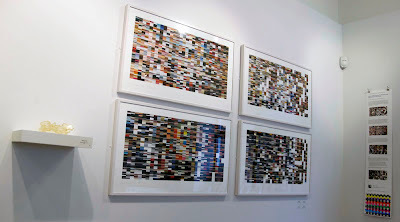 on display at the Northern Print Gallery, Newcastle, U.K.
my Vogue series at Christie's Multiplied. 18 - 21st October 2013. 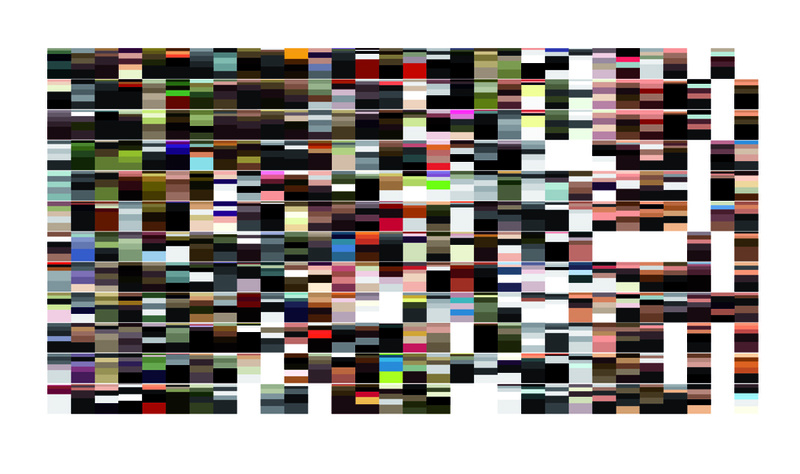 REACT at the Watershed Bristol's amazing Pervasive Media Studio have just announced funding for a new research project that sees myself and Dr Paul Laidler working together to explore the field of colour trend visualization. The collaboration will investigate target audiences and scope the development of easy-to-use software to engage users with the world around them through colour. Hold tight for more updates! 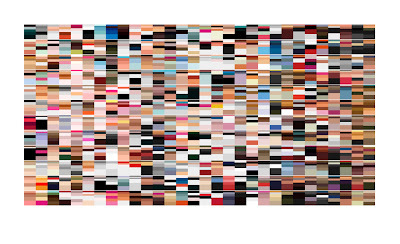 Stumbling upon this incredibly well organised website I was presented with some truly fascinating source material for a new set of colour trend timelines to follow on from my recent Vogue covers work. I got into reading science fiction at an early age and as a designer have always admired penguin covers. It’s nice to see Penguin's iconic orange making a comeback. 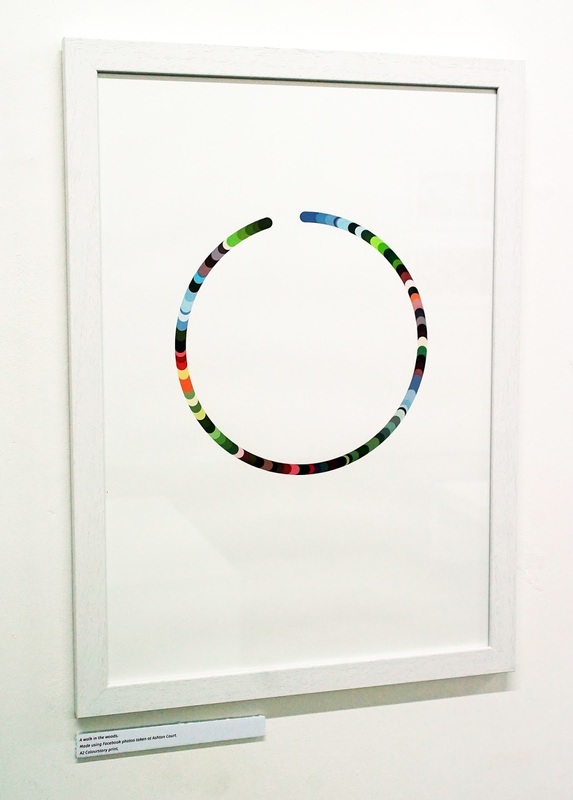 Limited edition of 50 signed and numbered A2 42 cm (W) x 59.4 cm (H) archival UV inkjet prints on fine art cotton paper. £40 each including worldwide postage. 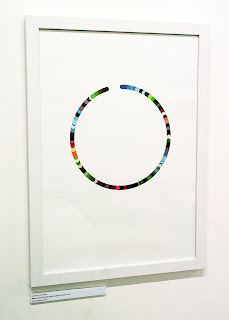 Limited edition of 20 signed and numbered A1 59.4 cm (W) x 84.9 cm (H) archival UV inkjet prints on fine art cotton paper. £65 each including worldwide postage. 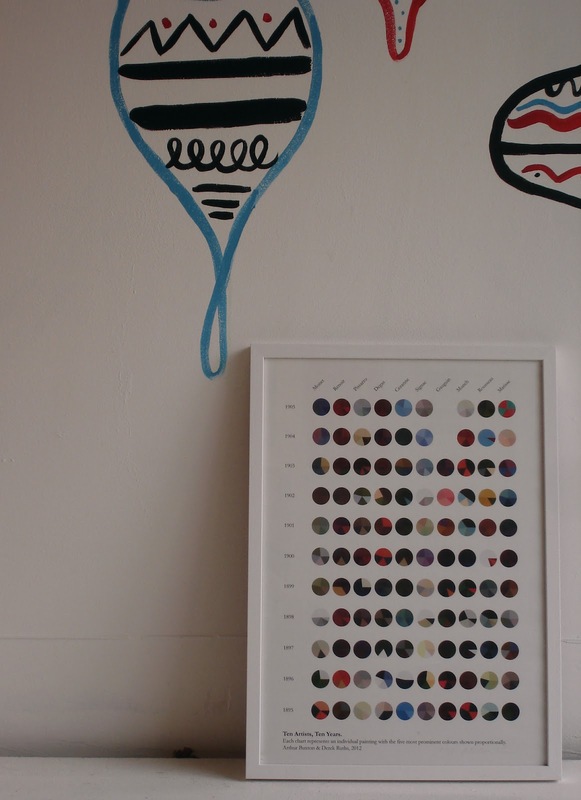 Ten Years, Ten Artists print (framed) Limited edition of 50. 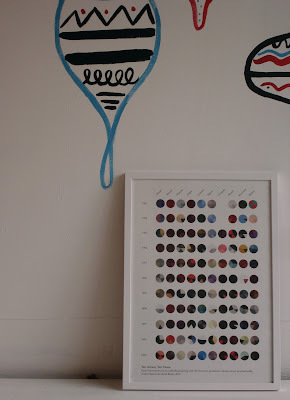 Trendy new homewares retailer Howkapow, who are getting lots of love from The Guardian this year, have started stocking my Ten Years, Ten Artists print! You can still get it direct from me here or you can buy it from Howkapow here along with all their other stylish designer goodies. If you're in Bristol be sure to visit their wonderful new shop. 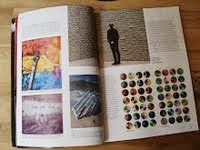 Signed and numbered edition of 10 printed using archival UV inks on Somerset Velvet enhanced radiant white 225gsm paper. 50 cm (w) x 51.34 cm (h). My Vogue Series is on display at the Northern Print gallery in Newcastle as part of a group show called 'Just Press P' until the 10th of August. 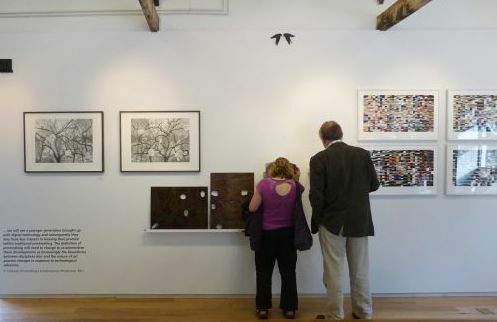 Here's a review of the show by Sarah Oglivie. Ten extraordinary years of art history - the Impressionists, Neo - Impressionists and Post - Impressionists were responsible for a revolution in color. Within this colour trend visualisation, each chart represents an individual painting with the five most prominent colours shown proportionally. 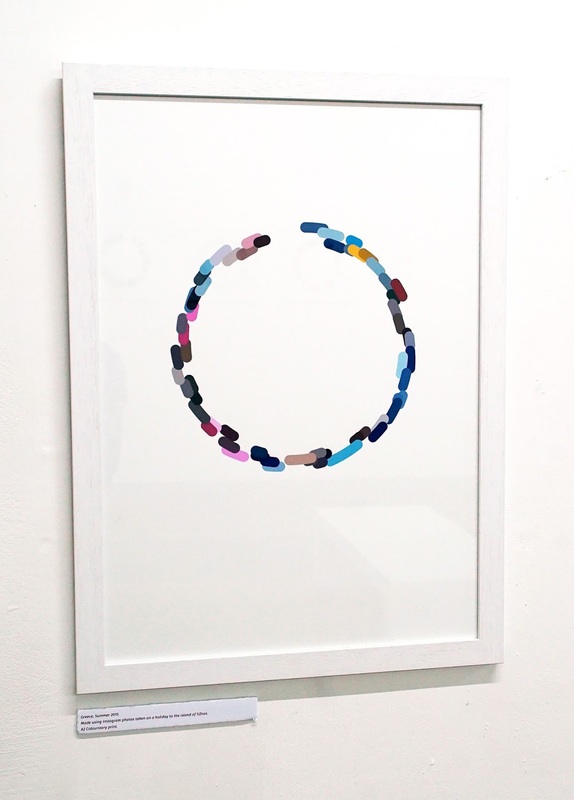 Signed and numbered limited edition of 50 printed on 170gsm coated matte paper using archival inkjet inks. A2 size (594 x 420 mm / 23.4 x 16.5 in).